Cocktails are an important part of any wedding, it is a party after all! One of our favorite trends in weddings that we here at Magnificent Moments Weddings are currently loving is the creation of signature cocktails. 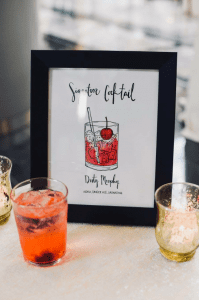 These customized drinks are a great way to show off your couple style while sharing your taste with your guests and adding some fun flare. Today we thought it would be fun to share some signature cocktails we have had at our past weddings to give you some inspiration! Couple Brittany and Michael drew inspiration from their last name in the creation of this signature cocktail. Vodka, ginger ale, and grenadine was the perfect mixture for their guests to enjoy as they celebrated at cocktail hour. Elizabeth and Dennis used their furry friends when selecting their signature cocktails. Each pet had their own unique drink named after them. Plus they made this adorable sign which featured a cartoon version of their lovely pets. What a cute way to make them a part of the event! Allison and Nasser choose a delicious mocktail for their event by offering their guests Saudi Champagne. 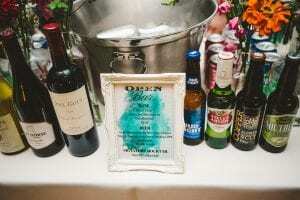 This refreshing drink was the perfect addition to the bar and allowed all guests the ability to toast the happily married couple! Signature cocktails are a fun addition to any wedding. Not only are they a great way to show off your personality to your guests but they are also a great practical choice. By selecting one or two signature drinks you can limit the types of alcohol needed which means wonders for your bottom line. Talk about win-win! Want more great ideas to make your wedding stand apart from the crowd? Contact Magnificent Moments Weddings, we would love to share our inspiration with you!